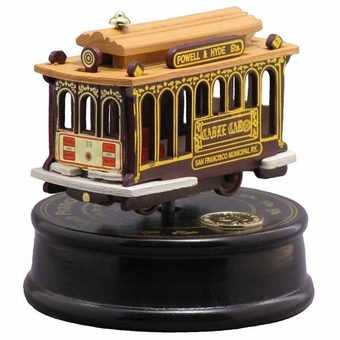 A timeless piece, this turntable music box showcases the iconic cable cars for which San Francisco is known Turn the Cable Car counter clockwise and to hear the tune "I Left My Heart in San Francisco" and realize why so many have left their hearts in the City by the Bay. The top of the 4.5" round turntable is accented in gold foil and includes a round Cable Car embossed medallion. Is really beautiful!!!! I love it!!! !